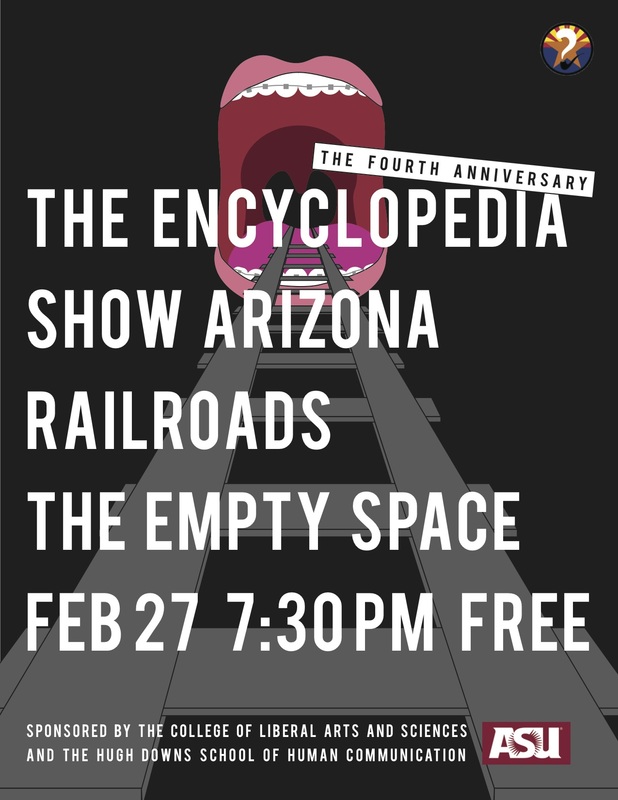 The Encyclopedia Show AZ is turning 4 on Monday February 27. If the Encyclopedia Show AZ was a human, it would be stumbling around, annoyingly asking everyone “Why?” all the time. Turns out, thats exactly what we do anyway but with a stage, an audience, and a concept. This month, our topic is Railroads! As always the show is free and will feature a variety of semi-educational performances from the community’s poets, performers, musicians, etc. This train is pulling out of the station promptly(ish) at 7:30pm. Heres to four more years of Encyclopedia Show AZ! Everybody with me now: FOUR MORE YEARS! FOUR MORE YEARS! FOUR MORE YEARS!